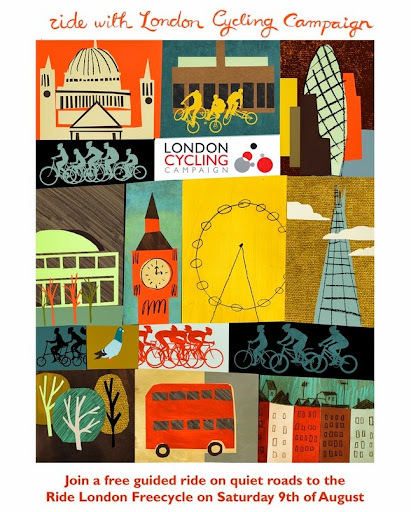 This Saturday, 9 August 2014, cycle with more than 50,000 other cyclists around a traffic-free central London with the annual Ride London Freecycle event. Join Lambeth Cyclists for a ride up to central London which leaves at 10:30am from Clapham Common. Cycle at your own pace to take in London sights such as Buckingham Palace, The Mall, the Houses of Parliament, St Paul's and Trafalgar Square on a leisurely bike route. There will be festival zones at Green Park, St Paul's, Guildhall Yard, Leadenhall Market and Tower Hill where you can try out new bikes, fix bike problems, get food and drink and find out more about cycling in London. There is no need to register - just get on your bikes and ride! Lambeth Cyclists will be running a guided 'feeder' ride up to central London from Clapham Common. Come and join other cyclists from Lambeth on this safe and fully marshalled leisurely ride departing Clapham Common Bandstand at 10:30. We will also be leading a return ride in the afternoon. For further information contact Lambeth Cyclists - lambeth_cyclists@hotmail.com / 07973786015.